‘Teachings Around the Sacred Wheel – Finding the Soul of the Dreamtime’. Wakan-Tanka, I thank you for our ancestors, for the life they have given each of us, and for the traditions they have preserved and handed down to us. Wakan-Tanka, I thank you for my life and the opportunity to know you, to serve you and to serve our people. Continue to make me a responsible person and help me add to the good things you and my ancestors have given me. Wakan-Tanka, I thank you for those who are yet to come and who will carry on from where we leave off. Help them to preserve the traditional life for the generation to come after them so as to keep the hoop turning. Wakan-Tanka, I thank you for my brothers and sisters who are here to share this precious moment. I pray that you will bless them and always be with them. I’m sorry that I didn’t get a chance to add this event in ‘Coming Events’, but as all things happen as they should, I’m sure that those who needed to be there, and were ready, were there. The main purpose of this gathering was to find those who really do know and walk the absolute truth of the Great Spirit. It was an experience beyond words to see so many people who had endured the wait, to stand proud, in front of the elders and the Great Spirit, and firmly proclaim that they “accept the responsibility”. True shamans, medicine people, and holy people do not try to cheat or fool anyone to just get by. They work constantly, studying and perfecting their craft, and they don’t waste time or any other resources. But most importantly they keep their life in balance, between physical needs (Body), psychological needs (Mind), emotional needs (Vital and Heart), and spiritual needs (Soul). My knowledge of life comes mainly from my own experiences, which have led me to study all the cultures’ mythologies and religions of the world; and to understand the similarities between these, shamanism, and Carl Jung’s psychology. Jung actually put himself through a type of shamanic initiation so that he could observe all the different ways he could think and feel. And now he has given us all a better understanding of the human psyche, with all its different levels, which is what the shamans call the many parallel worlds that exist at all times. A powerful belief in spirituality governs and influences the way one interacts with other people and relates to her or his environment. The natural place of worship/communion with AIO Matuua, God/Goddess, the Divine Parents, and Rehua (Christ). Assemble and join forth all peoples (of the world). Pursue enlightenment and uphold the presence and breath (of the Great Spirit)… unconditional love. All peoples unite and move forward together. As darkness comes, the mirrors of your spirit reflect different images. It is the time when the world changes and your being begins to glow. Reflect on the new vision that has been living on the perimeter of your consciousness. An idea is stalking you and awaits your invitation, a place within you to begin life. The totality of your creativity comes after you have begun your work on the sacred painting of your life. It is then that the muses of inspiration surround you like eagles and cheer you on to illumination. Take responsibility for your work and your life, and then illumination will follow. The eagle of the east is the messenger from the earthly spirit to the Great Spirit. A true spiritual seeker will have the deepest respect and utmost reverence for all religions. We can treasure all religions and claim them as our very own. Each religion is like the branch of the God-tree. 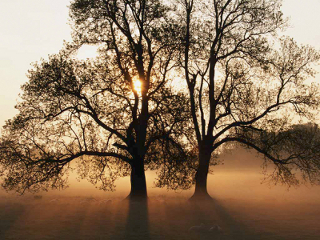 How can we deny the value of the branches when we accept the tree as our very own? Each religion is right, absolutely right, in its own way, but when we cry for the highest Truth, love of God becomes our only religion. True spirituality will not demand the renunciation of any religion. If you remain in your own religion and practice the spiritual life, you will be able to run very fast toward the goal. Your own religion will give you constant confidence in what you are doing. Again, you may feel the need to transcend religion. In either case, your goal is to realise God, who embodies all religions and, at the same time, is far above [and beyond] them. [My Grandfather and I] talked many times about becoming a man. Indian boys think of nothing else most of the time. They are in a hurry to prove that they are men, I was no different. The first time my Grandfather and I discussed this, he told me that most boys must take a feather from an eagle without harming it, and that would make them a man. So, naturally I was busy trying to figure out how I would do this and become a man as soon as possible. Soon I had a plan, and set about trying my luck. I built a small hatch out of branches that I could sit in with branches for a roof, and I covered it all with leaves and twigs. I had been raising rabbits and pigeons for some time, so I decided to start feeding the eagle. Each day I would take a rabbit or a pigeon out to my hatch and tie the poor thing on to the roof of my hatch. I watched for many days with no luck, but then, down out of the sky the eagle swooped and landed on my rabbit. It sat there for about an hour enjoying its meal, I was totally excited that my plan had worked. So, then each day after that I would take my poor rabbit or pigeon to the hatch and the eagle would arrive for its feast. Soon I began to sit under the hatch and watch the eagle while it ate its meal. After a few days of watching, I finally built up the courage to have a try at grabbing the eagle. The eagle was sitting there enjoying its meal and I reached up and grabbed its two legs. As you can imagine the eagle was not very pleased about its situation. Then with both hands full, I pushed my head up through the branches and bit into the eagle's tail feathers, and pulled with all my strength to remove the feathers. At this stage the eagle started pecking at my hands, and I still carry the scars to this day from the damage the eagle inflicted upon me. But after letting go, he flew off and I had four beautiful eagle feathers in my mouth. I ran all the way to my Grandfathers house to show him that I had indeed become a man. I was eight years old at the time, and my Grandfather was very pleased with my success and amazed that I had been able to get four feathers from the great eagle without harming it. He then started fixing the cuts covering my hands. As he cleaned the blood from my hands he reminded me that he had said that most young men had to gather an eagle feather to become a man, but he said that that didn’t include me. Because I was a special person, it would require a special task for me to become a man. I was very hurt to find out that I had not succeeded in becoming a man after all that hard work, and the injuries I had sustained. At that point, still in a hurry to become a man, I asked my Grandfather what special task I would have to perform to become a man. He said it would have to be very difficult because I had done the normal manhood task so easily. I was thinking at the time that the many weeks of hard work and waiting should have been enough, but I said nothing. He then told me that my task might be something like killing a deer with only my knife, so that my wilderness skills would improve. I was already thinking how I would perform this new task, and in just a few minutes had figured out what I would do when my Grandfather shocked me by saying; “And no, you can’t jump out of a tree on top of the deer.” Which is exactly what I was thinking. Many times throughout my life my Grandfather was able to read my mind or show up just when I needed him the most. He would simply say; “I heard you, so I’m here.” He saved me from myself throughout my life. If I were doing the wrong thing he would arrive and tell me to change my ways. Even when I was at University, he would turn up and tell me to change the road I was on, so that I may become a "real person". He was always right, and he helped me to come down to earth and realise that the only true road to travel is the humble road. Finally, at the age of fourteen I did become a man. After many weeks of stalking deer with only my knife, I learned to become part of the bush. I was covered from head to toe with branches, and I rubbed myself all over with the mulch from the forest to mask my smell. I prayed each day to the Great Spirit to help me to finish my task. But success didn’t come until I remembered one of the lessons my Grandfather had taught me as a young boy. One morning I prayed to the Great Spirit as usual, then I prayed to the spirit of the deer, asking the deer to give its permission for me to become a man. As I asked the deer to give itself to me, I told it that its sacrifice would stay with me for the rest of my days. I promised that I would use every part and not waste anything, using the stomach and bones in my mother’s garden, so that his sacrifice would improve the land on which we walk. I promised to use his antlers for beautiful buttons and necklaces for my family, and I promised to use all the meat and share it with as many people as I could. I then wished the deer a good journey, and I promised to join up with him in the next life where I would feed him and look after him as a friend. After smudging myself with the smoke from my fire to make myself pure, I set out for another try. I had only gone a short way when, to my surprise, a beautiful buck was standing in the trees feeding. I froze where I stood, and shortly the buck started walking toward me. He must have thought I was a bush, because he walked within a couple of feet of me, so I struck out at him with my knife. I had been able to stab the deer in the neck, and with a quick turn and slice, I had cut the animal’s throat. The deer suffered very little, and quickly died in my arms comfortably and without any thrashing about. He had willingly given himself to me and died with a look of peace in his eyes that I will never forget. And as all Indians do, I took his last breath in my mouth to take the spirit of the deer with me for life. I cleaned the animal and ate a small strip of the liver, as is the custom. I carried every part of the deer home and kept my promises to the deer. I crushed its bones and placed them in my mother’s garden. I made buttons and necklaces for members of my family, and I made jerky from the meat, which I shared with everyone. I am not ashamed to admit that I cried for the deer and his sacrifice in the forest that day. I had tried unsuccessfully for three weeks camping in the forest, and it wasn’t until I showed reverence to the animal, that it gave itself to me. Showing me that the true meaning of becoming a man is not just being strong and brave, but to show true reverence, love, and care for all God’s creatures and this beautiful earth that he gave us all to live upon. 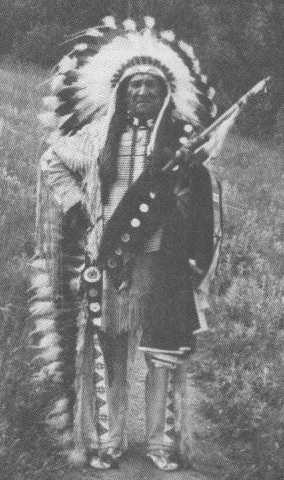 Plenty Coups or Aleek-chea-ahoosh, meaning "Many Achievements”, was a noted Mountain Crow warrior who never fought against the white man. Plenty coups was born in the Crazy Mountains near Billings, Montana in the summer of 1848. 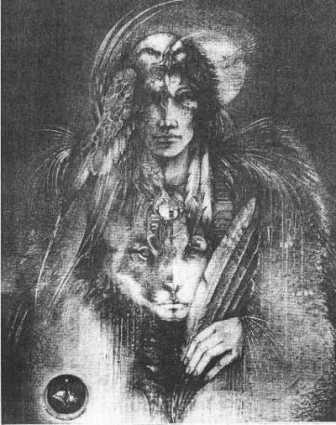 He was the son of Otter Woman, a Crow, and Medicine Bird, a part Shoshone warrior. He received the name Aleek-chea-ahoosh from his grandfather who said “I have dreamed that he will live to count many coups and be old; my dream also told me that he will be a chief – a great chief our people will ever have.” In his youth, he achieving 80 feats of valour in combat, he also had boyhood names of Faces the buffalo North and Swift Arrow. His war exploits were such that he became a chief when he was about 25 years old. In 1876 Plenty Coups was the leader of General Crook’s Indian Scouts during the campaigns against the Sioux. Some say Plenty Coups was responsible for, the successful negotiations with the Northern Pacific Railroad in gaining the right to construct the line through the Crow territory; the payment made to the Crow was larger than the settlement usually made in such transactions. In 1883 Plenty Coups led the delegation conferring with the Davies Commission, and shortly thereafter went to Washington, D.C., to strengthen the Crow claims for land payments. 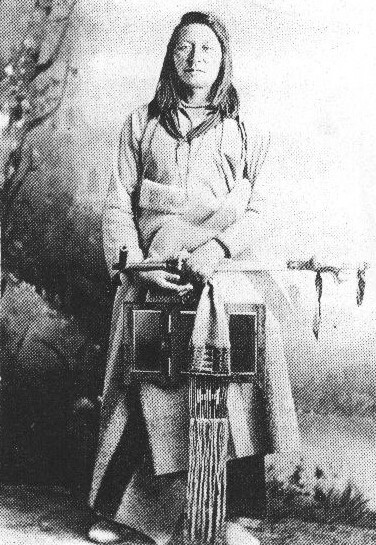 Plenty Coups became one of the first of his tribe to take up farming and ranching by which he grew prosperous, and by 1890 he was regarded as one of the most respected Crow leaders. 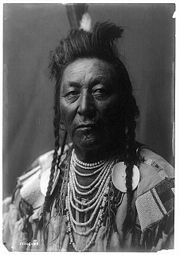 In 1904, when Pretty Eagle died, Plenty Coups became the principal Chief of all the Mountain Crow people. Despite occasional friction, Plenty Coups held the Whites in high esteem, and during World War 1 he urged his young men to join the U.S. Armed forces. Later Plenty Coups was chosen to be the Indian representative at the tomb of the Unknown Soldier at Arlington, Virginia on November 11, 1921. Plenty Coups was reputed to have had 11 wives, among them were Magpie, Strikes the Iron, and Kills Together, but he had no children. On March 4, 1928, Plenty Coups and his wife willed their home and 200 acres to the United States as ”a memorial to the Crow Nation”, to serve as a reminder of friendship between the Indians and the Whites. Today it is maintained as a museum of Crow culture and history. Plenty Coups died at Pryor, Montana on May 3, 1932. As an indication of Crow regard for Plenty Coups, it was decided that after his death, there would be no more Crow "Chiefs". "By the time I was forty, I could see our country was changing fast, and that these changes were causing us to live differently. Anybody could now see that soon there would be no buffalo on the plains and everybody was wondering how we could live after they were gone. There were few war parties, and almost no raids… White men with their spotted-buffalo [cattle] were on the plains about us. Their houses were near the water-holes, and their villages on the rivers. We made up our minds to be friendly with them, in spite of all the changes they were bringing. But we found this difficult, because the white men too often promised to do one thing and then when they acted at all, did another." "They spoke very loudly when they said their laws were made for everybody; but we soon learned that although they expected us to keep them, they thought nothing of breaking them themselves. They told us not to drink whisky, yet they made it themselves and traded it to us for furs and robes until both were nearly gone. Their Wise Ones said we might have their religion, but when we tried to understand it we found that there were too many kinds of religion among white men for us to understand, and that scarcely any two white men agreed which was the right one to learn. This bothered us a good deal until we saw that the white man did not take his religion any more seriously than he did his laws, and that he kept both of them just behind him, like Helpers, to use when they might do him good in his dealings with strangers. These were not our ways. We kept the laws we made and lived our religion. We have never been able to understand the white man, who fools nobody but himself." "The ground on which we stand is sacred ground. It is the dust and blood of our ancestors. On these plains the Great White Father at Washington sent his soldiers armed with long knives and rifles to slay the Indian. Many of them sleep on yonder hill where Pahaska – White Chief of the Long Hair [General Custer] – so bravely fought and fell. A few more passing suns will see us here no more, and our dust and bones will mingle with these same prairies. I see as in a vision the dying spark of our council fires, the ashes cold and white. I see no longer the curling smoke rising from our lodge poles. I hear no longer the songs of the women as they prepare the meal. The antelope have gone; the buffalo wallows are empty. Only the wail of the coyote is heard. The white man’s medicine is stronger than ours; his iron horse rushes over the buffalo trail. He talks to us through his ‘whispering spirit’ [the telephone]. We are like birds with a broken wing. My heart is cold within me. My eyes are growing dim – and I am old…"
Counting Coup was originally a game of war, where they would swing their axe at the opposition, but at last second they would turn their axe so as to hit with the flat side of the axe and only thump them on the chest. This is called a coup and if it were a real war the opponent would be dead. But by doing this in real war, it showed how brave a warrior was. At the end of a game both sides would count the coup to decide who had won. I am a woman of the twentieth century a white woman living in an urban setting and in an era which we have lost our traditions, our ceremonies, our rituals. In losing touch with these ancient circles of mystery, which were once the gateways to uncommon dimensions of reality, we have lost touch with the wilderness of our own spirit. I write at a time of hope, however. Many of us are reaching out, looking for alternative ways to understand the rhythms of Mother Earth, to worship God or the Goddess, and to balance the male and female energies within ourselves and on the planet. We have come full circle in our quest, and the ancient concepts of shamanism, the sacred Dreamtime, and the sacred wheel of shamanic teaching are now alive and fresh again. We have been able to move around the wheel from shamanism through science and back again to the beginnings, to our origins. We can again realise that we are nothing without the Great Spirit, the Creator; we are nothing without our magnificent Mother Earth, who gave us life. We are made from the stars and to the stars we must return. Throughout my journey, I have been blessed with extraordinary teachers, native teachers, women who have taught me the ancient and sacred way of woman. My teachers, who are called the Sisterhood of the Shields, have taught me that three hundred thousand years ago, the star nations came down to Mother Earth from the Pleiades, and they invested great knowledge in our planet. This knowledge was planted, like seeds, in the oceans, the trees, and the mountains, and this wisdom has been uncovered at various times throughout our history when, but only when, our societies have been ready to hear it. Much of what was told was memorised by certain women who represented the indigenous cultures of the world. These few women transmitted this wisdom, through the oral tradition, to their daughters and apprentices throughout time until now. Teachings Around the Sacred Wheel describes some of what I have learned and have been asked to teach by the Sisterhood in my own process of evolving. When I was in Nepal and Tibet, I prepared with the Sisterhood, and then with the help of my research at home in Los Angeles, a series of trainings to be given at certain times. This workbook is the result of that process. The work here is designed to help beginning shamans exercise their intent, their shaman will, their ability to visualise and manifest on different levels of consciousness. Every word and sound is chosen carefully to produce an elevating effect within the person using the book. The book is not devoted exclusively to traditional Native American tribal techniques; it incorporates the shamanic teachings of the Sisterhood of the Shields. We in the Sisterhood are shamans, but we are not affiliated with any tribe. The teachings that we pass along originated three hundred thousand years ago, but we are of this time and of this soil, and I have learned that we must make peace with the spirits of the land. It has been shown to me that no one owns the truth, that we, as children of Mother Earth, must reach hands across cultural boundaries and heal our Great Mother. Whether we live in the great cities of the world or in the wilderness, all of us, through the sacred teachings, can learn to reconnect with our origins. Body -	The Body is the heaviest vibration and therefore is the physical life of matter. It can be either idle (undivine) or energetic (not restless – divine). Vital -	The Vital makes up many of the emotions and unconscious reactions, and is very much where our desires come from. The undivine aspect is hostile aggression, and the divine quality is dynamism and wakefulness. Mind -	The Mind contains our mental or conscious thoughts and some emotions. The PHYSICAL mind is infinitely afraid of the infinite vast; it houses the ego; and it fears, doubts, and is jealous of everything. The SPIRITUAL mind stays in the aspiring heart and sees the higher truth. Heart -	The Heart is the receiver and sender of love, divine light, and joy. It is never limited. The heart simplifies, the mind complicates. It is all love, all sympathy, all concern, all purity, all harmony, and all oneness. Soul -	The Soul is the highest vibration and is therefore all light and all divine. It is the transcendent self, the God self, or Inner Pilot. Prayer is speaking to God, Supreme, Great Spirit, or any name you prefer. Meditation is listening to God etc. Several generations ago during the most turbulent of the desert wars in the Middle East, a spy was captured and sentenced to death by a general of the Persian Army. The general, a man in intelligence and compassion, had adopted a strange and unusual custom in such cases. He permitted the condemned person to make a choice. The prisoner could either face the firing squad or pass through the Black Door. This was not an easy decision and the prisoner hesitated, but soon made it known that he much preferred the firing squad to the unknown horrors that might wait for him behind the ominous and mysterious door. Not long thereafter, a volley of shots in the courtyard announced that the grim sentence had been fulfilled.